I stayed here for one night while traveling across NM. It's a small nice place. There are showers and the sites have water and electricity hook ups. The only downside is that there is a feed lot about 1 1/2 miles away. Based on the wind direction, there can be an odor that permeates the air. Otherwise it's a nice place for an over night stay. 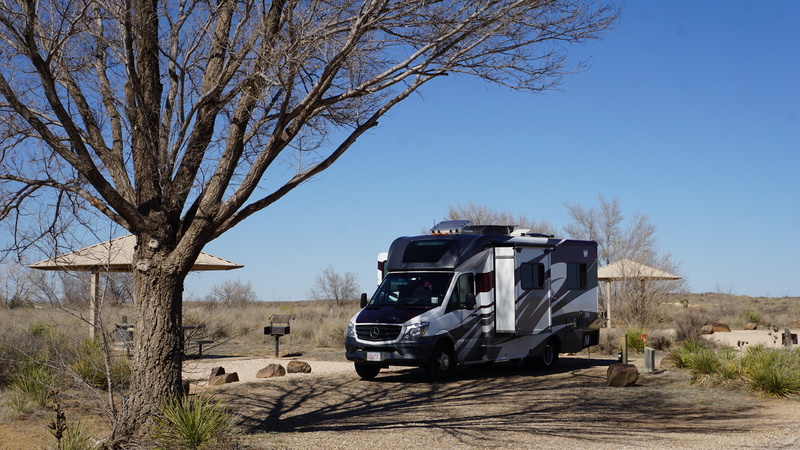 This state park sits in a prairie south of Lubbock and north of Portales. Sites have water and electric, ramadas with tables. Sites are huge; about 100' long. Most are pull thrus. Nice bathrooms with good shower. Some trees but the ramadas provide most of the shade. There is a small lake which they say is stocked with very large catfish; didn't see any but I'm not a fisherman. There is a trash can at each site, which is something you don't see very often anymore. In fact, I walked down the road to a trash can because I just didn't expect one at the site. It's a real bargain at $14. Small park with with several shady electric/water sites. Three sites had 50 amp. I paid $14.00 and was happy. Small lake where people seemed to be catching fish. Many birds. Quite area. 5 miles to WALMART. Good cell phone service.